One of the biggest ‘90s resurgences? Mom jeans — we’re talking Rachel Green, straight-legged, high-waisted ones that your mom is probably wearing in all of the pictures of her youth. But don’t let them scare you — they’re a vintage twist on your go-to skinnies, and are a foolproof way to make any outfit look just a little bit cooler. Give your skinny jeans a break and try a straight-legged, looser fit. Animal prints are the trend of 2019, and snakeskin is leading the pack. Here, the shoes do all the talking, and the simplicity of the black turtleneck and jeans make it a cool-girl look you could wear from brunch to a night out. 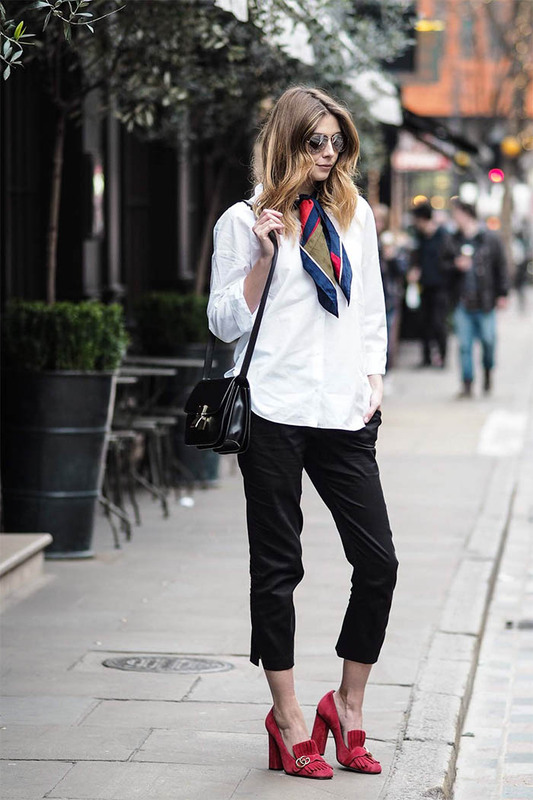 A white button-up and loafers can make for a sophisticated workwear look, but when paired with mom jeans, give a lax vibe that can be your new everyday uniform. Colorblock sweaters are making us think of warmer days (Will spring ever come? Unsure at this point!). A fun sweater with your go-to booties and mom jeans can take you from the gray days of winter to spring with a pop of color. If someone told me I could only keep one item of clothing from my closet, I’d pull out my blazers and cling to them for dear life. This is a perfect example of how a blazer does notneed to equal workwear. Pair one with your favorite straight-legged jeans for a day-to-day look that’s anything but stuffy. To make it extra trendy, throw on a pair of white booties — they can be scary at first, but they go with everything your go-to black ones do! This is the simplest, easiest of the outfits. Pairing your favorite tee and sneakers with mom jeans instead of skinnies makes it feel more relaxed, and is an easy way to make your closet staples look more fashion-forward. Ah, where would we be without our leather jackets? They immediately pull together any outfit and are the ultimate investment piece — they’ll never go out of style. This look could be worn for anything your day could bring — it’s casual enough to go grocery shopping in but put-together enough to wear to happy hour with your girls.